Kevin Blackistone, Mervin Block, Patricia Callahan, Jose Costa, Karen Ferguson Fuson, Gillian Flynn and John Schulian. The seven NU alumni will be inducted into the Medill Hall of Achievement. 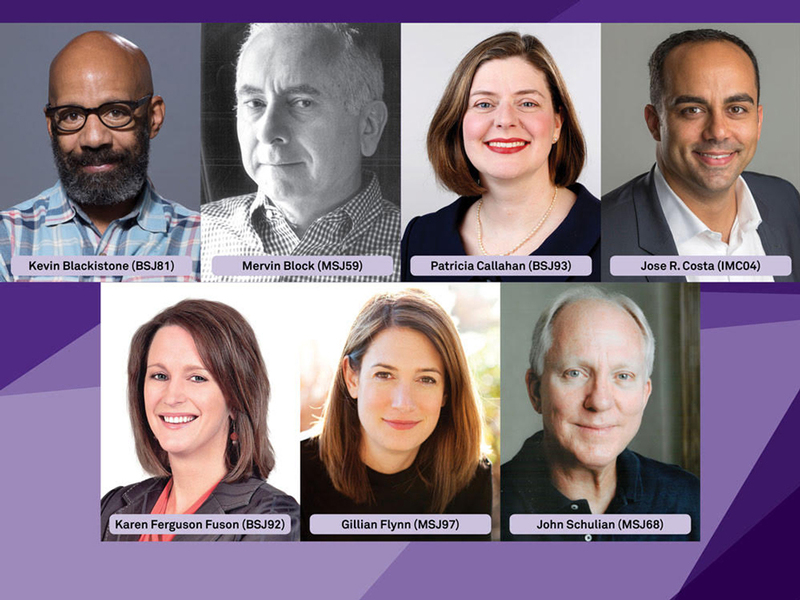 The Medill School of Journalism will induct seven alumni into its Hall of Achievement, the school’s highest honor, later this month. The inductees include Kevin Blackistone (Medill ’81), Mervin Block (Medill ’59), Patricia Callahan (Medill ’93), Jose Costa (Medill ’04), Karen Ferguson Fuson (Medill ’92), Gillian Flynn (Medill ’97) and John Schulian (Medill ’68). Flynn is the award-winning author of the thriller novel “Gone Girl,” which was adapted into a 2014 film starring Ben Affleck and Rosamund Pike. Her novel “Sharp Objects” is currently being adapted into an HBO miniseries starring Amy Adams. Blackistone is a columnist for The Washington Post and a contributor to ESPN’s “Around the Horn.” Block has written scripts for broadcasters at CBS, NBC and ABC, as well as multiple books on broadcast news writing that are still used in classrooms today. Callahan is an investigative reporter for the Chicago Tribune and has shared two Pulitzer Prizes. Costa is the CEO of For Eyes, an optical retailer, and has worked in leadership roles at Maaco and Burger King. The Hall of Achievement was established in 1997 and includes a number of distinguished Medill alumni. Blackistone will be honored in the fall, while the other six honorees will be recognized during a ceremony and panel discussion on May 17.